Hello and greetings! If you follow me on Instagram, you’ll probably know I’ve been traveling and hopefully from the title, you’ll have figured out exactly where to. Yes, it’s Disneyland! I absolutely adore Disneyland and go pretty frequently, so I have a few tips and tricks that I’d love to share with you, especially since it is summer which is peak visitor season and you might even have a Disney vacation of your own coming up. 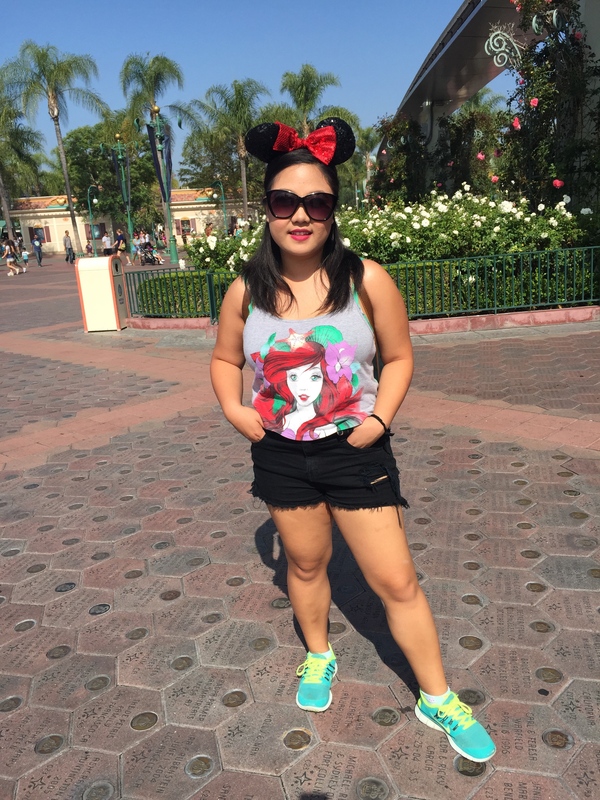 This week’s post is going to focus on a sweatproof, heatproof, long lasting makeup look inspired by Ariel and also what I keep in my bag with me when I am in the parks. Also, this year marks the 60th anniversary for the park, so the Disneyland Diamond Celebration is going on. Since there are some new things that are exclusive for the Diamond Anniversary, I thought that I would take you along with me too and try something new this week. For this post, I thought it best to try and do a video format. I don’t have any good cameras for filming, so this is shot with just my iPhone 6 and also this is my first experience making a video like this, so please bear with me. If you have any comments, leave them below! Pictures with all the links to used products will also follow. Now, without further ado, here’s my first ever video post! Bring water & snacks! Food and beverages can add up over a visit, so keeping a few of these items on hand is a great way to stay on budget. Check the weather for the day. If you are planning on staying until the evening, you might want to bring a light jacket for when it cools down. Sometimes it is also nice to have a spare change of clothes for after a water ride as well, or at least a spare change of socks or perhaps a pair of flip-flops to change into when you are on the ride. (Walking around in wet shoes is the worst!) On days where it is hotter, this is probably unnecessary but sometimes in transitional seasons at least an extra pair of bottoms will be nice if you are not completely dried off by the time evening rolls around. That said, plan on riding water rides accordingly. During the warmer months, you can ride much earlier in the day so that you are dried off quickly by night. I find that around 11 is a good time, as it is warm enough that it will feel refreshing, early enough in the day so that you are practically guaranteed to be dry later, and also early enough to beat the crowds that flock during mid day. Speaking of lines, some parts of the parks are busier during others. You can use the app Mouseaddict to navigate the traffic. It also gives wait times for attractions and meet and greets as well as a map and other great features. Out of all the free Disney apps I’ve tried, this one by far is my favorite. Note parade times and routes and plan accordingly. If you have a fastpass to say Indiana Jones, but are currently in Tomorrowland when the parade is about to start, you probably should take a detour through Fantasyland through Frontierland or take the Train since the main passage will be crowded. Get fastpasses! They’re free! If you don’t know, these are special tickets that you can pick up at select attractions and rides that give you a call back time when you can enter a reduced size line. You can only get 1 fastpass per person (you use your park ticket to get it) and you cannot get another one until a certain amount of time has passed. If you are confused, you can always look at the regulations online or ask any Cast Member while you’re in the parks! Look for Hidden Mickeys! This is a great way to pass time in line. You can get various apps to help you out as well! Mossimo Backpack– I find that a small backpack is the perfect size to carry around the parks. It is not overwhemingly large that it gets in the way of rides or gets too heavy, but also carries a nice amount with room to spare for any souveniers you end up taking home! Plastictail Oversized Butterfly Sunglasses, Elizabeth & James “Nirvana White” Rollerball, Colourpop Lippie Stix “I Heart This”– Sunglasses are a good idea, especially during the summer months as most of the time you will be outdoors. Also, touch up fragrance and lip color are part of any handbag staples. Minnie Mouse Ears, Tsum Tsum Stitch, Ewok Keychain, Bath & Body Works Caribbean Escape hand sanitizer– These are my little treasures that get me in the Disney spirit, if you will. Whenever I go to Disneyland I find it only appropriate to sport a pair of mouse ears. These sequin ones are pretty popular and the headband style I find easier to wear than the classic hat shape. The plush keychains are there mostly because they are adorable but also to create a place for my hand sanitizer to hang from. Disneyland has thousands of people visit daily, so carrying around some disinfectant is most likely a good idea. Agent 18 Mini Backup Battery, My Charge Power Bank, Parkhopper Ticket, Photopass- This little pouch is my tiny bag of my most reached for items. I’m always on my phone, especially when I have to wait, like in line for the rides, so my battery dies pretty fast. Portable chargers are great for situations exactly like these, when outlets are not easily available. I have two because my phone likes to run out of juice pretty quickly, for whatever reason. I like the Agent 18 one best, though, because it does not require an extra cord to go along with it. My ticket for the park also goes in this pouch so that I do not lose it and makes it easy to find quickly for when I park hop, or need it for a fast pass. When I have a fast pass, I also keep it in here so that everything is in one spot. Also, I have my Disney Photopass which allows you to get your picture taken at designated photo spots by Cast Members. Forever 21 Toiletry Bag, Merona Wallet– To see the exact contents, see my What’s in My Bag post, but I mostly keep very handy items that one usually keeps in a handbag in here including medicine, tissue, eye drops, chapstick, etc. Putting it in a pouch like this makes it easy to transfer from my purse to my bag. 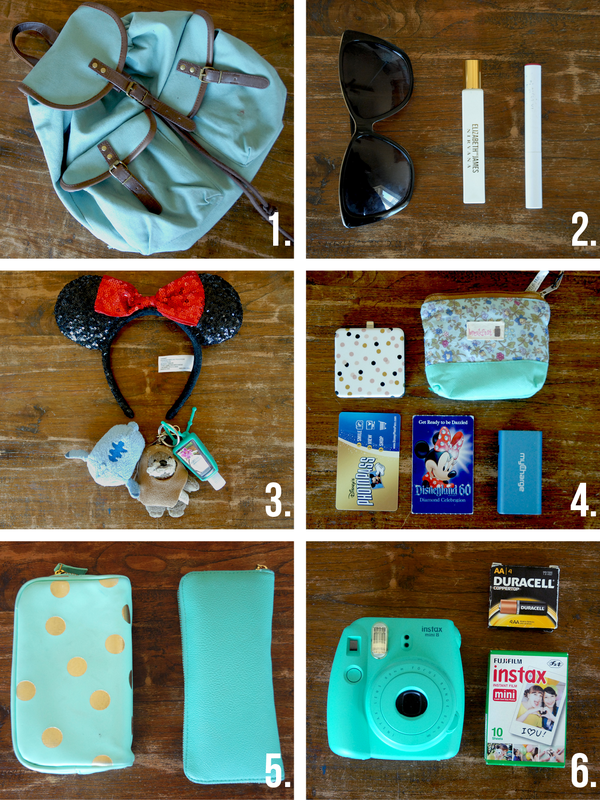 Fujifilm Instax Mini 8 Turquoise, Fujifilm Instax Mini 8 film, Duracell AA batteries– I’m a bit of a photo junkie, so I love having different ways to capture memories. This is my Polaroid camera which I just recently got for summer and have been loving already. I brought extra film and batteries just in case. Also, if you watched the video I had a set of mganetic iPhone lenses as well. These are a cheaper alternative to step up your photography game, if you please. Originally I also was going to recommend a selfie stick, if that is your thing, but they are soon going to be banned from the parks. Unpictured items: Water bottle & light jacket. Alrighty, I hope you enjoyed this post and let me know in the comments below what you thought of the video! This post combines both my love of Disney and makeup so it is very special to me. Special shoutout to my family for putting up with me filming, but especially my brother who was a tremendous help in editing it! Music is courtesy of Soundcloud. I love you all and I’ll catch you in the next one!